Whether you realize it or not, there’s a beast that’s been lurking in your local convenience store refrigerated section for longer than time itself. This week’s Midnight Snack watches you move between aisles like Michael Myers in Halloween, ready to make its move when of nowhere…..
IT’S SWIPED UP BY AN IRON-STOMACHED TRUCKER! AHHH!!! Looks like your gut will live to see another day. 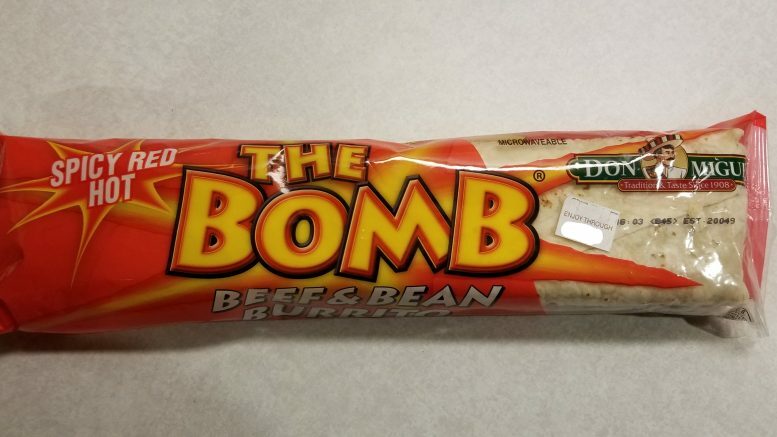 Maybe that’s a tough intro for a food profile and review, but c’mon, it’s called The Bomb, what would you expect from eating anything by that name? The price was definitely right for the number of good nutrients, (going off the label here, didn’t get the boys at the lab involved) not to mention how quick and easy a person could pop it in the microwave for a similar experience taste-wise to fast food without driving to a 24/7 burrito place at 1:00 am (or midnight sharp, if it HAS to be exactly at midnight to be a midnight snack). It was pretty heavy and packed a whopping 1100 calories, with the serving size recommendation to split it in half (but we all know that gets ignored). There was plenty to put a person in that comatose state until 11 am on a Saturday when it’s time to wake up and go to the football game. Don Miguel has been in business since 1908, so it sounds like he knows what he’s doing (or his kids do. or his ghost). The brand itself was actually started by a guy named Alejandro Morales back in the day because he was better at making awesome food than his day job of digging ditches. These days, if you follow the chain of command via the Wiki page, it looks like Don Miguel (and parent Megamex Foods) is a Hormel Company. Cooking instructions were pretty straightforward, telling me to tear near the top of the wrapper and start it at about 2 minutes (since it wasn’t frozen). I still don’t know what my microwave’s wattage is, and I plan to make eyeball guesses at the cooking time for the rest of my life. At the 2 minute mark, I reached in and flipped it over for 1 more minute, allowing for an evenly heated ‘rrito. This ensured the release of all its various innards to properly bomb my taste buds with flavor. Once it was done in the microwave, I had a bit of trouble getting our burrito friend out of its wrapper. I suppose it knew what was coming. While the sweaty burrito tried to fight gravity and ward me off with its heat, I still managed to make it come careening out and avoided spraining my wrist in the process. When it came to taste, the burrito was okay, but I can’t say it was over the top. The wrapper claimed it would be pretty hot but overall I could have gotten away eating it without a drink. It didn’t have to burn my mouth or anything (like that time I ate Flamin’ Hot Cheetos and needed to down about a gallon of milk to cool off) but a little more spice would have been nice. The beef and beans were good. My only critique would be that there were some really tiny pieces of bone (no more than 1 or 2) that I bit down on and spit out. Being just over 1000 calories, this was pretty filling. Would I buy this again and recommend? Yea, probably.